Moog has unveiled their latest analog synth: Sirin. It’s curiously subtitled “The Analog Messenger of Joy” and based on the legendary Taurus bass sound engine. It reaches well into the high octaves, however, making it a legitimate lead machine. 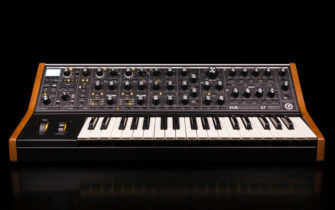 Moog have just announced the limited edition Sirin synth. If you’ve always loved the sound of a Taurus, but hankered for the high end, this one could be for you. The limited edition Sirin was created in honour of the Moog House of Electronicus in Los Angeles. It sports an almost identical front panel to the Minitaur, but its retro pastel colour scheme is more reminiscent of their recently released Grandmother. Visit Moog for more details.